(Nanowerk News) Spherical carbon molecules known as buckyballs may be able to keep the nation’s water pipes clear in the same way clot-busting drugs prevent arteries from clogging up. Engineers at Duke University have found that buckyballs hinder the ability of bacteria and other microorganisms to accumulate on the membranes used to filter water in treatment plants. They think that coating pipes and membranes with these nanoparticles may prove to be an effective strategy for addressing one of the major problems and costs of treating water. “Just as plaque can build up inside arteries and reduce the flow of blood, bacteria and other microorganisms can over time attach and accumulate on water treatment membranes and along water pipes,” said So-Ryong Chae, post-doctoral fellow in Duke’s environmental and civil engineering department. The results of his experiments were published March 5 in the Journal of Membrane Sciences. Filter material above shows growth of bacterial colonies which impede flow. Filter below, with Carbon-60 added, has no colonies. A buckyball, or C60, is one shape within the family of tiny carbon shapes known as fullerenes. It consists of 60 carbon atoms arranged in a shape very much like a soccer ball. The molecules are named after Richard Buckminster Fuller, the inventor of the geodesic dome, since their shape resembles his famous structure. According to Chae, the addition of buckyballs to treatment membranes had a two-fold effect. 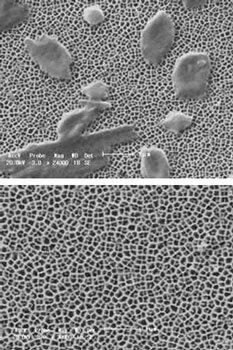 First, treated membranes showed less bacterial attachment than non-treated membranes. After three days, the membranes treated with buckyballs had an average of 20 colony forming units, the method by which bacterial colonies are counted. “In contrast, the number of bacterial colonies on the untreated membrane was too numerous to count,” Chae said. Chae also found that the presence of the buckyballs inhibited respiration, or the ability of the bacteria to use oxygen to fuel its activities. Gunsch said the mechanisms involved are not well-understood. Both Gunsch and Chae believe that since buckyballs are one of the most widely used nanoparticles, additional research is needed to determine if they have any detrimental effects on the environment or to humans. This is one of many issues being studied at Duke’s Center for Environmental Implications of Nanotechnology. The current experiments in the laboratory were conducted with Escherichia coli K12, a strain of bacteria that is widely used in laboratory experiments. “We focused on a quite specific microorganism, so the next stage of our research will be to see if these nanoparticles will have the same effects on bacteria commonly found in the environment or those in mixed microbial communities,” Chae said. “We also plan to build a small-scale version of a treatment plant in the lab to conduct these tests.” The research was supported by the Office of Naval Research, National Science Foundation and the Korea Research Foundation. Other Duke members of the team were Shuyi Wang, Zachary Hendren and Mark R. Wiesner. Yoshimasa Watanabe from Hokkaido University, Japan, was also part of the team.